Poem – The Ramadan Drummer – Hello Holy Days! Happy Ramadan Banner featuring the Ramadan Drummer. Designed by Manal Aman of Hello Holy Days! for Crate & Kids. Today I’m introducing a poem about the Ramadan Drummer. If you’ve been following Hello Holy Days! 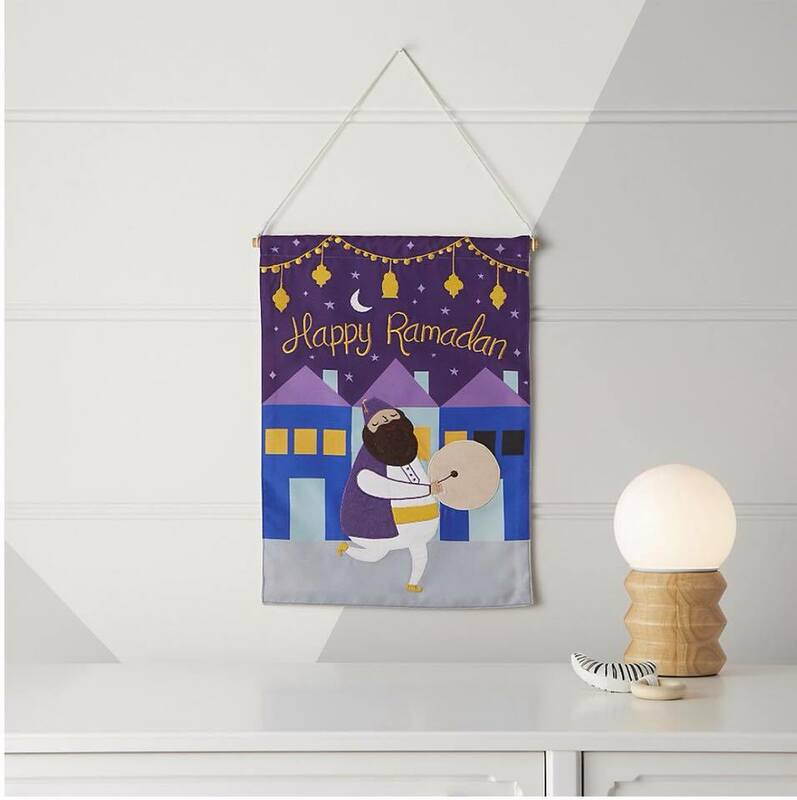 for a while and/ or recently purchased my Ramadan Drummer banner from Crate & Kids, you’re probably starting to become familiar with my concept of the Ramadan Drummer. I invented the idea of using the Ramadan Drummer as a holiday character for Ramadan/ Eid al Fitr because children love holiday characters like Santa and the Easter bunny – and Muslim children are no exception. I wanted to fill the void that American Muslim children feel when it comes to holiday characters by giving them a holiday character they can love and enjoy for Ramadan/ Eid! The tradition of a drummer waking people for suhoor during Ramadan is a centuries old, real, tradition in Muslim cultures. The drummer exists in several Muslim cultures including Nigeria, Pakistan, Turkey, the Levant and many others. Inspired by this authentic tradition, I invented a fictional Ramadan Drummer to fit alongside North American holiday characters. One thing you’ll notice about North American holiday characters is that they always have specific, unchanging physical traits. For example, Santa always wears a big red suit, he has black boots and sports a snowy white beard. A St. Patrick’s Day leprechaun always wears green, has a big tall hat and an orange beard. Similarly, I’ve created the Ramadan Drummer to have specific physical traits that I use in all my depictions of him, whether products or crafts. In this poem, I outline what some of those traits are so that kids can learn more about who he is and what he looks like. For example, The Ramadan Drummer always has a brown beard. His hat and vest are always purple. His shoes are always yellow. This poem is written in a poetic list style and I’ve made it available for you to download for free for personal or educational use. There are many ways to engage children with this poem. For preschool aged children, consider a performance reading. Read the poem and come up with actions or movements that go with the verses. For example, act out how the Ramadan Drummer bangs his drums, how he feeds his pet cat or how he marches through the town. Perform it together with the kids and get the little ones active! For children who are able to read, have them colour in the drummer with cues from the poem. For example, what colour does the poem describe the drummer’s hat as? Have them colour it with the according colour. If you purchased my Ramadan Drummer banner from Crate & Kids this poem is an excellent accompaniment to display in the home. You can print out the poem, put it in a frame and place it next to where the banner is hanging to encourage storytelling and imaginative play. For more about the Ramadan Drummer, please subscribe to my newsletter to be the first to know about my upcoming literary works and merchandise featuring the Ramadan Drummer. 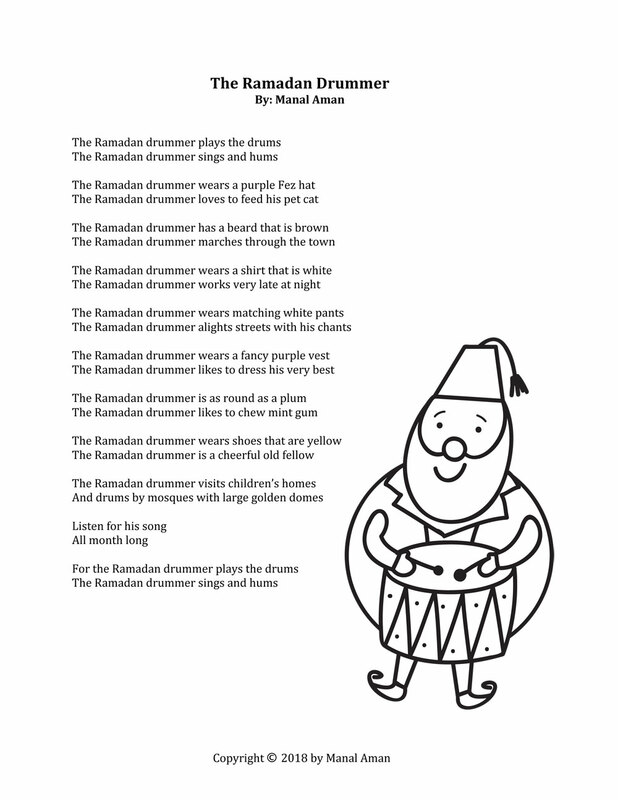 Please note the fictional Ramadan Drummer used as a North American holiday character is the intellectual property and trademark of Manal Aman and may require license for commercial use.